I’ve had trouble keeping my boys out of this butter! They watched intently as I made it on the stove and kept asking when it would be ready. We have enjoyed it on toast and homemade biscuits and bread, and the boys can hardly keep their spoons or fingers out of it. Hopefully there will be some left for breakfast on Thanksgiving morning! The sweet maple syrup and brown sugar balances out the tart fresh cranberries, and the cinnamon adds a bit of smokiness. I was pleasantly surprised at the addition of vanilla extract. You don’t really taste it, but the butter had a fuller, richer taste with the vanilla. It is easy to make and comes together in about 30 minutes with very little work. The original recipe doesn’t specify type of maple syrup, but Grade B is my choice for cooking because the flavor is richer than Grade A, which is commonly used as table syrup for pancakes and such. Trader Joe’s has their own brand of Grade B maple syrup, and I buy it faithfully. The recipe makes about 12 ounces of maple cranberry butter, which you can store it in the refrigerator for up to 2 months and in the freezer for 3 to 4 months. Adapted from Cooking Light, October 1997. Pour the cranberries into the sauce pan and add the water. Bring to a boil, then reduce heat and simmer about 5 minutes. The cranberries should all burst open. Blend the cranberry mixture in a blender until very smooth. Return the pureed cranberries to the sauce pan and add the maple syrup, sugar, and cinnamon. Bring to a boil, then reduce the heat to low and simmer uncovered until the mixture is thick, about 25 minutes, stirring frequently. Cool completely and store in a jar in the refrigerator or freezer. Will keep for up to 2 months in the refrigerator and 3 to 4 months in the freezer. That’s a great recipe! Marple syrup and cranberries, what a awesome combination! That would go great on a turkey sandwich. Oh Andrea, that’s one thing we can’t never get here… cranberries… only cranberry juice! I am definitely making this, Andrea. I have a 3-pound bag of cranberries in the fridge and a brand new jug of maple syrup calling my name. Thanks for the delicious idea. Andrea – Have you ever tried canning this recipe? I am looking for something new to can and give as gifts. This sounds outrageous – in a really great way! Hi Laura! Great question. This recipe doesn’t have enough acid to make it safe for canning with the boiling water method. You could add vinegar or the juice of one orange, but it will change the consistency and would need to be cooked longer to reach the buttery stage. It’s a small batch, just 12 ounces, so to make it worthwhile for canning you would need to increase the amounts substantially. I hope this helps. this sounds fantastic! might have to make it with the half bag of cranberries sitting in fridge! This sounds amazing. I’m thinking perfect for my little pre-Thanksgiving dinner tomorrow. Thanks for tweeting it! ooh, i did make this, and it was delish 🙂 thanks for the recipe! I made this and gave it to the ladies in our family for Thanksgiving. We all love apple butter and this is a flavorful twist on an old favorite. It is wonderful on biscuits – Love it! Since I only had a few tablespoons for myself, I made another double batch tonight. And I purchased some extra bags of cranberries and froze them, just so I could make more in a month or so. 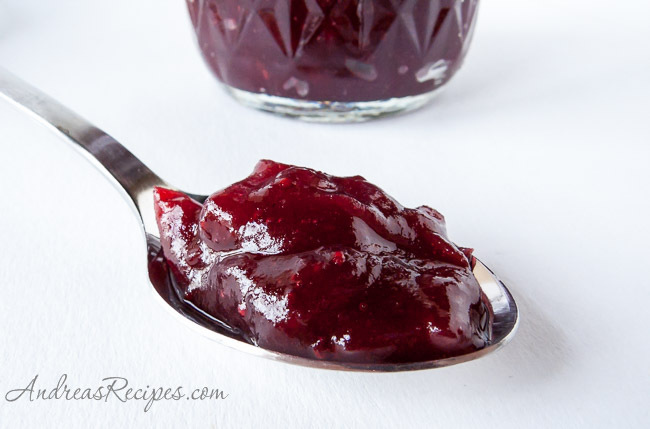 I had made my first pumpkin butter, and decided I wanted to make a cranberry bananna butter, and did it without looking for a recipe. It’s delicious, and a good variation. The preparation is the same, except I added the sugar when I cooked the cranberries and banannas, then pureed, and simmered for 30 min. I don’t think you can can this, but you should be able to freeze it.